Auckland, 28 September 2018 – New Zealand’s top 200 technology companies have achieved 38% growth in profitability* in the past year, according to a preview of this year’s Technology Investment Network (TIN) Report which will launch later next month. This is the fastest rise in profitability since the annual TIN Report first began in 2005, marking an important milestone as many high-growth companies begin to fund expansion organically and achieve economies of scale. Investors have responded positively to this news, with stock prices for the TIN200’s largest ten listed companies by market capitalisation surging 57.3% in the past year. “The sector is entering a new chapter in New Zealand’s technology story”, said Greg Shanahan, managing director of TIN. “The rising profitability reflects the wealth of experience, capital and scale the sector has built up; creating the foundations for widespread and stable growth”. “It’s important to stress also that this overall rise in profitability for the TIN200 has not been at the expense of revenue growth this year, but rather has been driven by these tech businesses now being more self-sustaining,” Mr. Shanahan added. This year’s TIN Report features a record 19 companies making a debut appearance on the “TIN200” – the ranking of New Zealand’s top 200 technology companies according to revenue. The number of new names joining the TIN200 list highlights the rising number of globally-competitive companies that New Zealand’s technology sector is now producing. “The advantage with technology as an industry is that, unlike dairy and tourism, it’s not stymied by natural resource and infrastructure constraints, other than access to talent and capital,” added Mr. Shanahan. The fourteenth annual TIN Report will be launched at a gala awards event to be held at the Cordis Hotel in Auckland on 24 October, featuring David Downs, General Manager Projects, New Zealand Trade and Enterprise as MC and headline speakers Rebecca Smith, head of listings and capital markets at Nasdaq APAC (ex China); and Doug Hastie, CEO of Christchurch-based Syft Technologies. Similar events will be staged in Wellington on 29 October and Christchurch on 30 October. The TIN Report monitors the performance of New Zealand’s 200 (TIN100 and Next100) largest technology exporters in the areas of Information and Communications Technology (ICT), High-tech Manufacturing and Biotechnology. It is sponsored by New Zealand Trade and Enterprise (NZTE), Spark, EY, Absolute IT, James & Wells and Simmonds Stewart. * Profit is measured as EBITDA unless otherwise stated. The TIN Report is produced by Technology Investment Network with sponsorship from NZTE (New Zealand Trade and Enterprise), Spark, EY, Absolute IT, James & Wells and Simmonds Stewart. 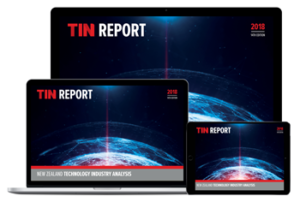 The TIN Report is a critical reference for benchmarking the performance of New Zealand’s 200 largest globally focused technology companies. The size of the tech industry has grown significantly since 2005 and in recognition of this,TIN sent surveys to approximately 700 companies in 2018.